THOUSAND OAKS, Calif., May 12, 2011 (SEND2PRESS NEWSWIRE) — Hill PHOENIX, a designer and manufacturer of commercial refrigeration equipment, and Arizona-based Sprouts Farmers Market will host a community open house at Sprouts’ first GreenChill Platinum Award-winning store on May 17 in Thousand Oaks, Calif. The Westlake Village store is only the third grocery store in the nation to receive the EPA’s highest GreenChill Award. * Adopt green refrigeration technologies, strategies, and practices. In collaboration with Sprouts’ construction and facilities engineering team, Hill PHOENIX designed and manufactured an innovative new solution featuring a full CO2 cascade system for both low temperature and medium temperature applications – the Second Nature® MT2LX. The Second Nature MT2LX system is one of the most environmentally responsible refrigeration systems available in the industry today and represents the next step in CO2 refrigeration technology. CO2 is used as a secondary coolant for the medium-temperature system and as a direct expansion cascade refrigerant for the low-temperature system. * CO2 is considered a natural refrigerant with very low global warming potential (GWP=1). * CO2 is an inexpensive, widely available refrigerant compared with HFC. * A more than 70 percent reduction in HFC refrigerant charge can be achieved. The entire primary refrigerant charge is confined to the machine room and condenser to enable simple leak detection and servicing. * The lines required for CO2 transport are typically one to two sizes smaller than traditional DX piping systems, reducing the weight of installed copper lines by 50 percent of more and reducing installation costs. 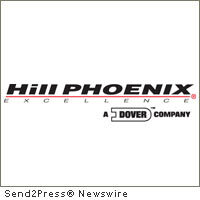 Hill PHOENIX Inc., a Dover Company, is based in Conyers, Ga. The company designs and manufactures commercial refrigerated display cases and specialty products, refrigeration systems, integrated power distribution systems and walk-in coolers and freezers. Visit www.hillphoenix.com or call 800-283-1109 for more information. Arizona-based Sprouts Farmers Market’s distinctive format offers a bright, cheery shopping experience that has been its cornerstone since the founders, the Boney family, opened their first produce stand in 1943. Our stores feature natural, organic and favorite indulgence foods at a great value, including mountains of fresh produce, all natural meats, seafood delivered six days a week and over 300 bins of bulk rices, spices, nuts and grains. Additionally, Sprouts offers a wide variety of natural and organic grocery and dairy items, featuring our own private label including over 1,000 gluten-free products. We also offer a large selection of vitamins, supplements, and healthy body care products. Sprouts now has 99 locations in Arizona, California, Texas and Colorado. For weekly ads, and other nutritional information, visit http://sprouts.com . The EPA GreenChill Partnership works with supermarkets to reduce refrigerant emissions and decrease their impact on the ozone layer and climate change. The Partnership provides information and assistance to help supermarkets transition to environmentally-friendlier refrigerants; reduce harmful refrigerant emissions; and adopt green refrigeration technologies, strategies and practices. For more information on EPA’s GreenChill Partnership, including its store certification program, please visit www.epa.gov/greenchill . Original Keywords: GreenChill Refrigeration System, Hill PHOENIX, Sprouts Farmers Market, EPA GreenChill Partnership, Tom McFarlane, commercial refrigerated display cases and specialty products, refrigeration systems, integrated power distribution systems and walk-in coolers and freezers Hill PHOENIX Thousand Oaks California THOUSAND OAKS, Calif.
REFERENCES: Business News, GreenChill Refrigeration System, Hill PHOENIX, Sprouts Farmers Market, EPA GreenChill Partnership, Tom McFarlane, commercial refrigerated display cases and specialty products, refrigeration systems, integrated power distribution systems and walk-in coolers and freezers Hill PHOENIX Thousand Oaks California THOUSAND OAKS, Calif.